I really love the 1950s fashion. 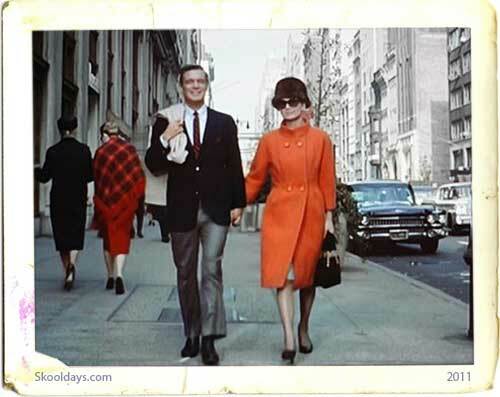 Breakfast at Tiffany’s captured the end of the decad as it entered the new swinging sixties, but my what wondeful colours and bright fashions the fifites brought us – still looks good today. Men, on the other hand, were not very concerned with fashion. At work, they wore what amounted to a uniform: a gray flannel suit. Conservatively tailored, and worn with a white shirt and tie, this standard suit style was so popular that it became a symbol for the businessman’s conformity. Younger, less formal men made the loafer, a slip-onleather shoe, the most popular shoe in America. Women’s fashions began to grow independent of the influence of Paris and London in the decade. The “New Look,” which is most associated with women’s high fashion, began with French designerChristian Dior in the late 1940s but was modified to suit American tastes. Women were fond of clothes that emphasized the female figure, with closely tailored bustlines, slender waists, and padded hips. Women also wore plenty of makeup.